Who am I? 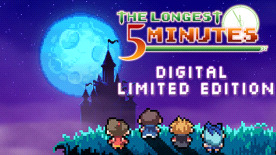 - Relive your memories and journey with your friends through a nostalgic RPG world! Reexperience Your Past! - Remember your signature move? Know that spell? Flashback has a unique power: Reexperience! Gain reexperience points the more memories you visit. Now, face the Demon King! Let's Take a Break! - Choose from three mini-games: Super Chain Reaction, Haunted Run, or Slot Machine to get more reexperience points!